Former president Olusegun Obasanjo has described the action of African leaders absent at the signing of the African Union Continental Free Trade Area ( AUCFTA) , as criminal. President Muhammadu Buhari , who cancelled his trip to Rwanda, was absent at the signing of the agreement. Buhari giving reasons for his cancelled trip to Kigali for the signing of the AUCFTA agreement framework said enough consultation was not made before the Federal Executive Council , FEC , approved the signing of the framework agreement for establishing the African Continental Free Trade Area . According to him , the agreement had the capacity to hinder local entrepreneurship and encourage the dumping of finished goods in Nigeria. 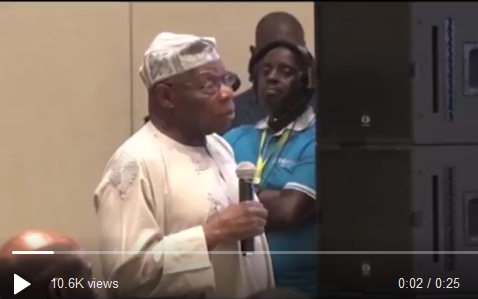 Obasanjo speaking in a video posted by NBS Rwanda at African trade agreement , criticised African presidents who refused to sign the trade agreement . He described their reason not to assent to the trade agreement as ‘ mere flimsy excuse and criminal.